Why should you play the Eclipse Phase RPG? A number of reasons. Firstly, the setting is cool. It’s like Cowboy Bebop meets Mass Effect meets Neuromancer. It also (on purpose, I’m sure) channels the old Paranoia RPG. Like… a lot. The overall tone, however, is decidedly less humorous than Paranoia, but certainly no less dark. That being said, the core Eclipse Phase rulebook and all future supplements are being released under the Creative Commons license. Specifically, the CC BY-NC-SA license. That is, you are free to share or remix Eclipse Phase as long as you do so non-commericially, attribute the original licensor (in this case, Catalyst Game Labs), and only share your remixed work under the same license. Unlike Wizards of the Coast and their “Open Gaming License” which wasn’t all THAT open, this truly is Open Source Gaming. Which is another reason you need to play this game. The potential within Eclipse Phase for the community to be able to develop and re-use the material is like few RPG’s before it. 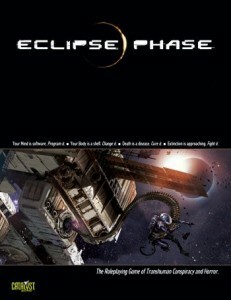 So, here is the torrent to download Eclipse Phase. Yes, it’s legal and cheap as free. Oh, just checked the Eclipse Phase blog, and apparently, Eclipse Phase is the number one seller on DriveThruRPG.com. Not bad for a free, open source product. While surfing the Wired RSS feeds, I noticed an article about the return of the “Choose Your Own Adventure” series of books. Apparently, they are updating and releasing eight of the original titles. I am happy, yet saddened at the same time. What saddens me is that these titles are getting “updated”. Maybe it’s just the nostalgic part of me, but this would be like someone rehashing William Gibson’s Neuromancer to make it more compatible with how the future really unfolds. I don’t like it. Leave the classics be. I don’t have a problem with releasing new CYOA books. A kind of TNG for the CYOA series is fine with me. But let’s leave TOS alone, please. I would prefer there not be a “Choose Your Own Adventure: Special Edition” where the guns are replaced with walkie-talkies or whatever. On the other hand, I am overjoyed that these books, which apparently sold half a billion (as in billion, with a “B”) copies, will be re-launched and make it that much easier for my future children to enjoy these books, as I did when I was l’il squirt. This series and the Encyclopedia Brown series were the books that kept me busy until I started moving onto the “hard” stuff like Asimov and Brin. (I, like my father, plan to introduce the Foundation series at an early age.) The great thing about the “Choose Your Own Adventure” series is that they were also my first experience with a truly interactive media experience. The great thing about these books was that I think they really built the foundation for my love of video games and PnP RPG’s. Interactive Fiction built the bridge from normal literature and mindless shoot ’em ups to games like Wasteland and Adventure Construction Set. The similarities between CYOA and CRPG’s should be pretty obvious. In fact, I’d be interested to know how many game designers have been influenced by these works. In fact, I wouldn’t be surprised if these were the first foray into interactive fiction for most gamers. So, I for one welcome our new “Choose Your Own Adventure” overlords!